Prices include shipping within the United States and Canada. Because international rates are quite complicated it’s much more difficult for me to ship to other countries. If you’re interested in having one of these sent outside the US and Canada, contact me at bws(at)webomator(period)com. 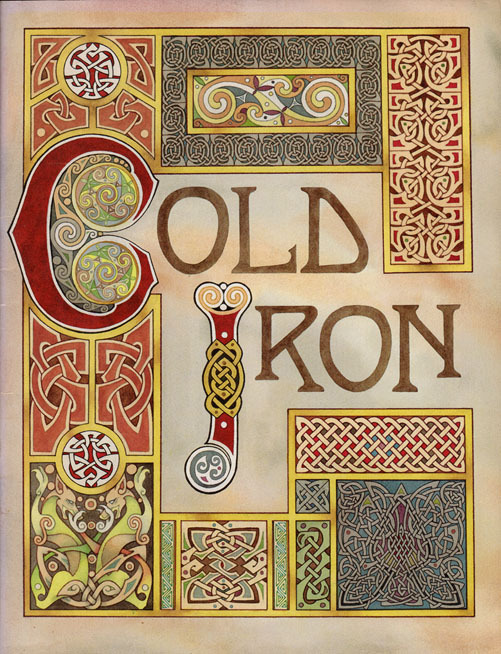 My 1986 front cover for the Leslie Fish/Rudyard Kipling Cold Iron songbook, published by Off Centaur Publications in 1987. The original watercolor, at about 20 by 24 inches, is much too large for my scanner. So I’ve scanned the printed cover for you here. The cover’s painted on heavy watercolor paper and is not mounted or framed. Due to its size, packing and shipping this piece may take longer than packing and shipping the drawings. 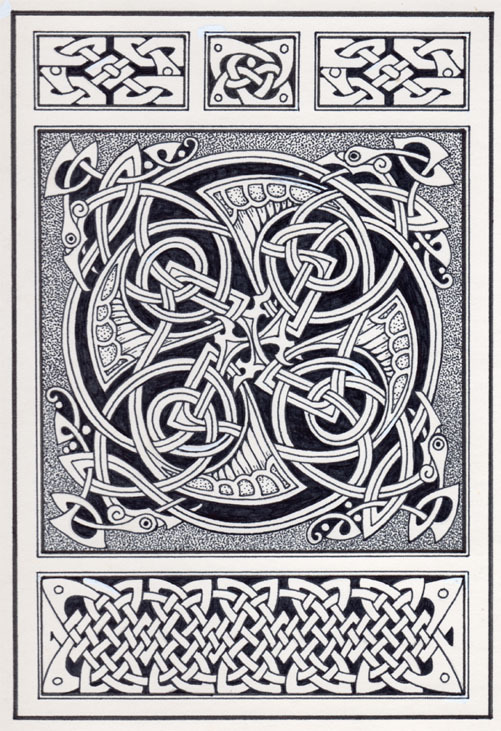 My 1986 illustration for this Kipling poem is a knotwork panel that features a design of interlaced birds. A year later I was to do a digital version of the design for a computer animation project (‘Charon’, based on the short story by Lord Dunsany). The drawing is about 5″ by 7 1/2″ on bristol board. My 1986 illustration for this Kipling poem formed a two-page spread, with the lyrics between the artwork. This left side shows us a helmet on the ground – something that I always thought represented death – in the marshes. The drawing is about 10″ by 4″ on bristol board. My 1986 illustration for this Kipling poem formed a two-page spread, with the lyrics between the artwork. This right side shows us the survivor of the battle. 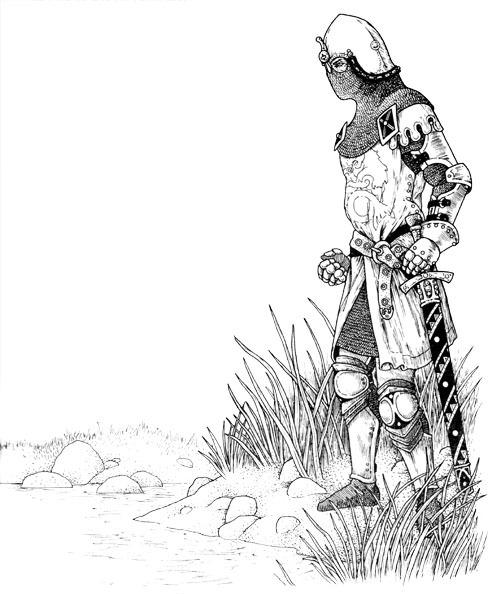 His eyes are aimed at the helmet on the facing page. The drawing is about 10 1/2″ by 12″ on bristol board. My 1986 illustration for Rudyard Kipling’s poem The Winners, from the Leslie Fish Cold Iron songbook published by Off Centaur Publications in 1987. The drawing measures about 9 1/4 by 13 inches, on a larger sheet of Bristol Board. My 1986 illustration for Rudyard Kipling’s poem A Deathbed, from the Leslie Fish Cold Iron songbook published by Off Centaur Publications in 1987. The drawing measures about six by six inches on a larger sheet of Bristol Board. My 1986 illustration for Rudyard Kipling’s poem The Quest, from the Leslie Fish Cold Iron songbook published by Off Centaur Publications in 1987. The drawing measures about 9 1/2 by 13 inches, on a larger sheet of Bristol Board. Prices include shipping within the United States and Canada. Because international rates are quite complicated it’s more difficult for me to ship to other countries. 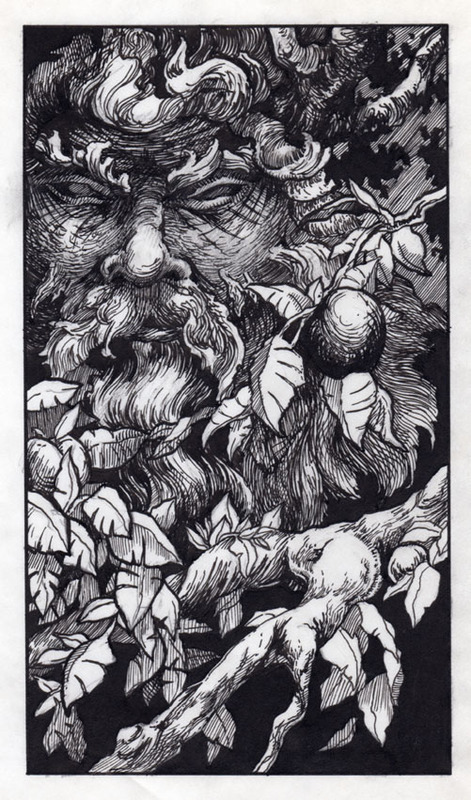 This was an illustration for a poem in the center spread of Runestaff #32 in 1985. 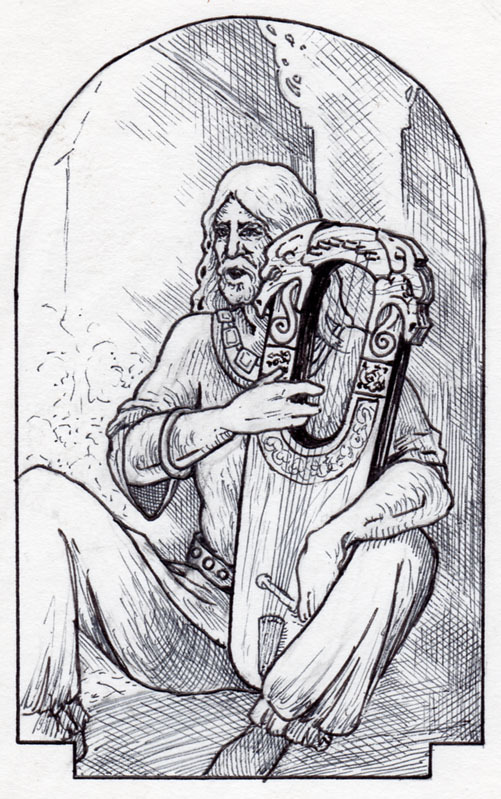 The drawing shows a musician playing a cruit. The cruit (sometimes crwdd) was originally a lyre, but seems to have evolved into a bowed precursor to the fiddle. The two boars at the bottom of the border are based on a clasp found in the Sutton Hoo burial. This ink drawing is about 8″x12″ on a slightly larger sheet of bristol board. In some issues, I used an assymetrical border with a small vertical illustration. This is one of those, from 1983. 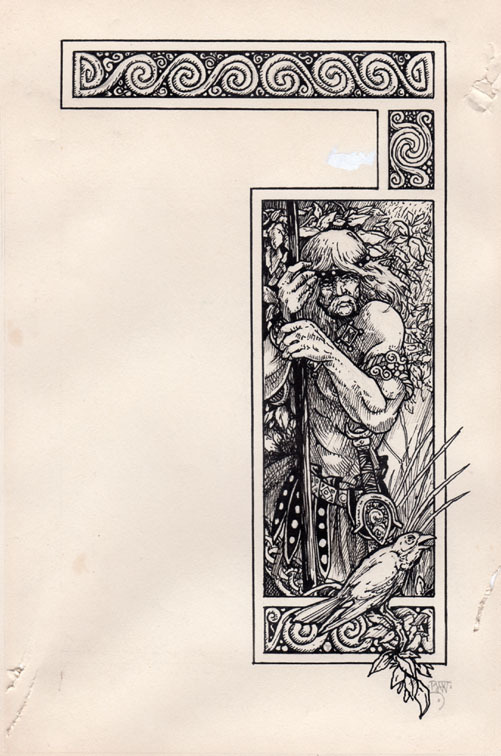 This was used (within an asymmetrical border) on the contents page for Runestaff #29 in 1984. 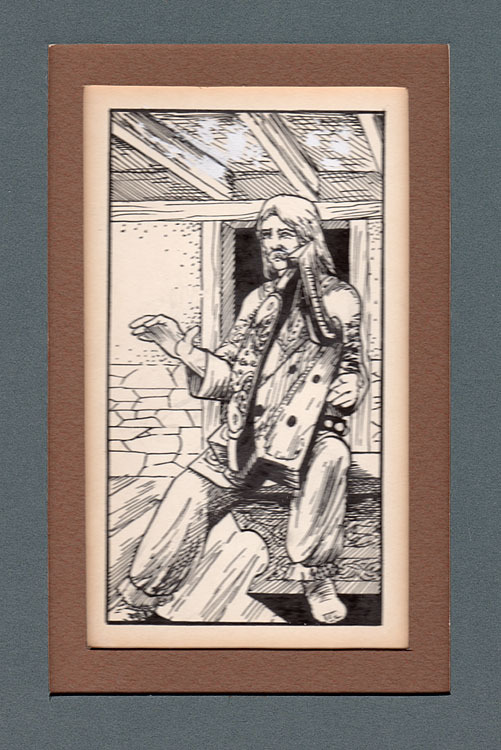 One of many harpers I drew for these illustrations, this one measures about 3″ by 5″ and is matted in a double matte that’s marred with two slight indentations. This scan is slightly out of focus due to the depth of the matte. 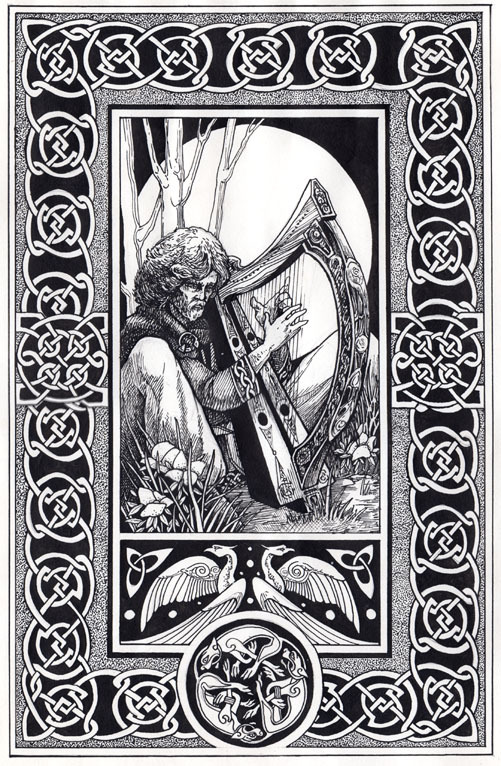 The low-headed Irish harp on the harper’s lap resembles both the Trinity College and Queen Mary harps. 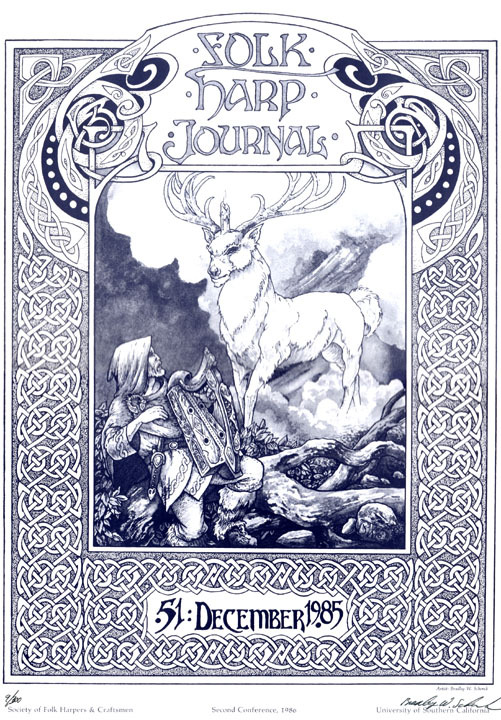 This was used (within an asymmetrical border) on the contents page for Runestaff #30 in 1985. The instrument he’s playing is a simple whistle, like a pennywhistle. 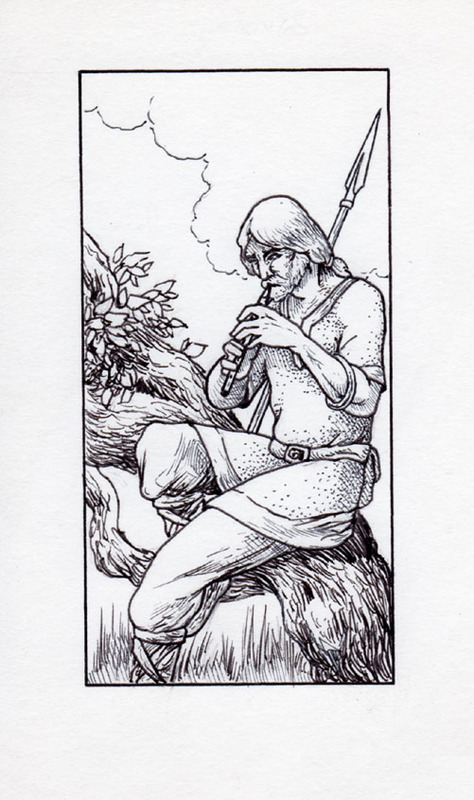 This cover for Runestaff #30, in 1985, shows a saxon or norse musician with an instrument called a rota. A well-known semi-surviving instrument was found at the Sutton Hoo burial site; this one more closely resembles a different instrument from (I think) Württemberg. It’s been a long time; sorry. But I built and carved one very similar to the rota we see here. The drawing is about 3″ by 5″ on Bristol board. In print, it appeared inside the usual Runestaff cover border. 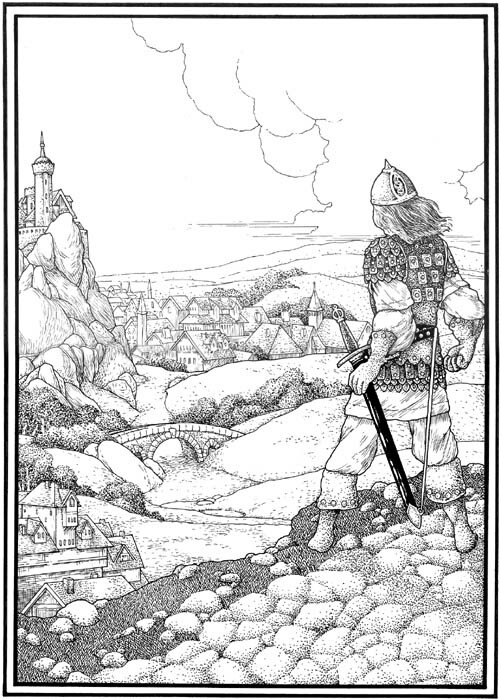 This drawing from 1985 appeared in the Introduction for Runestaff #30. 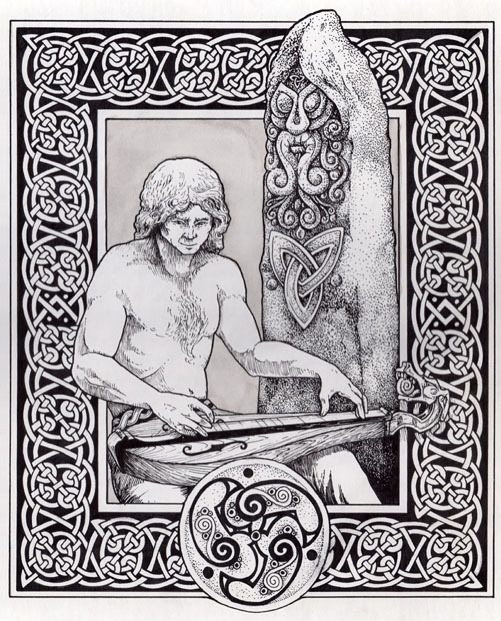 It’s a close-up view of the hands of an Irish harper, though the harp isn’t being played on the left shoulder. That was traditional, but I often used the more modern method that puts the treble strings under the right hand. The drawing is about 3 1/2″ by 5 1/2″ on Bristol board. 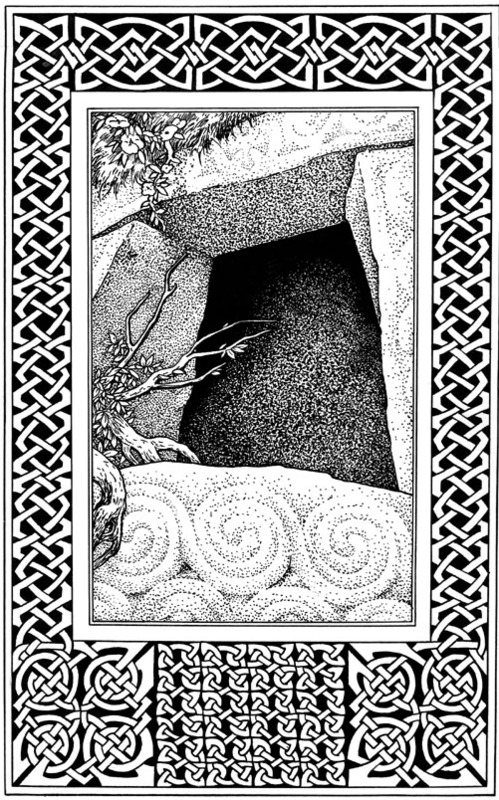 This drawing illustrated a poem in Runestaff #20 in 1983. I’m very happy with some of the border elements; though several of the patterns are traditional I think I did some interesting things with them. This was about the time when I started to think in knotwork designs and new ones just flowed right out of my hands, but I was aiming for something more traditional in this border (with the exception of the phoenixes). The drawing is about 7 1/2″ by 11 1/2″ on paper. 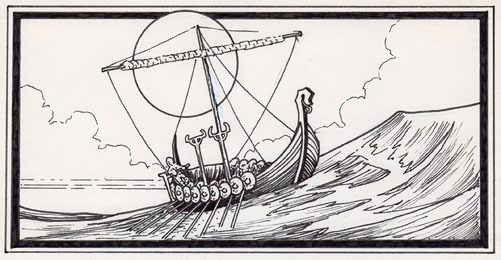 I drew quite a few longships for the Runestaff‘s covers and interiors; here’s one from issue 27 in 1984. The drawing is about 7″ by 3 1/2″ on paper. 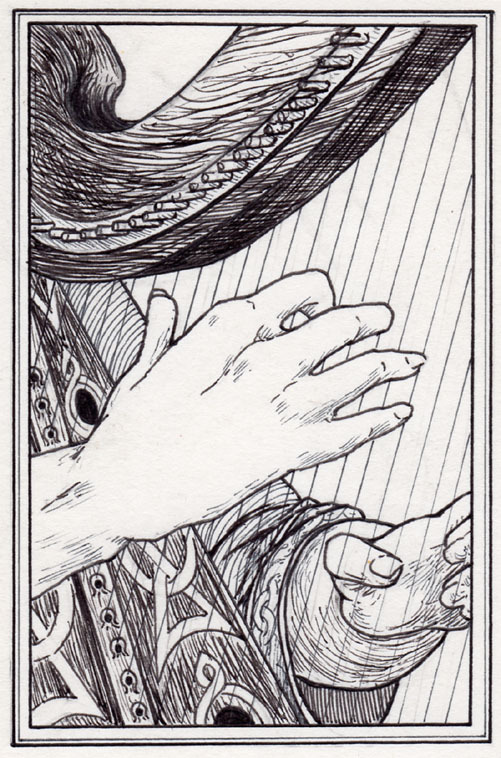 With all the many harpers I drew for the Runestaff, and the smaller number of craftspeople and their work, I guess it was inevitable that I’d include harpmakers. In the foreground, one is carving the tenon at the top of the pillar. The other guy is probably telling him that he’s done something wrong. This was used in issue #24. The drawing is about 6 1/2″ by 4″ on paper. All right, I failed to track down what issue (and year) saw this little illustration. It looks like 1983 to me; that’s about all I can tell you. 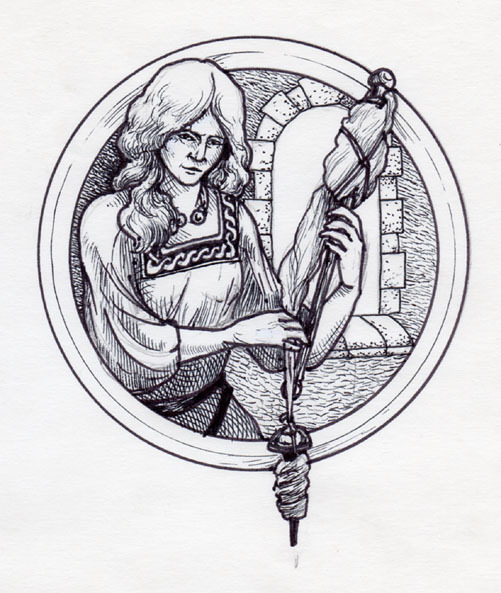 Here, anyway, is a small picture of a woman unreeling fiber from her distaff while she spins it with a drop spindle. From sometime. The drawing is about 3 1/2″ by 4″ on paper. 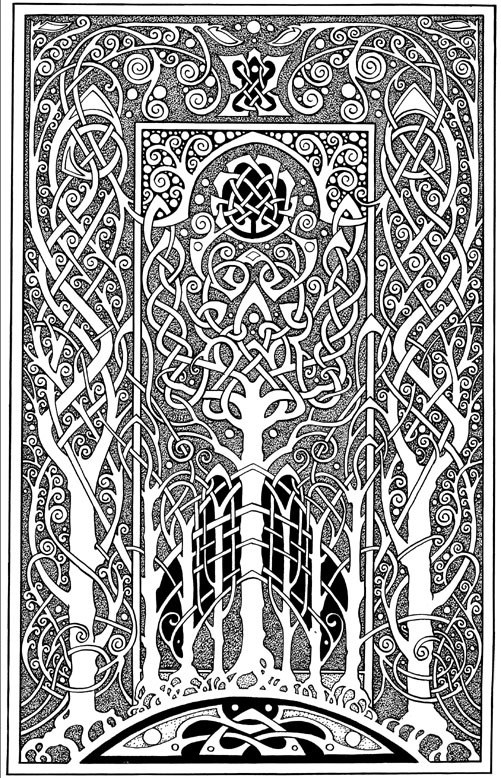 This illustration from the center spread of Runestaff #35 is a complex “carpet page” design of trees that was suggested by my discovery of Art O’Murnaghan’s beautiful Celtic Revival art. I’ve revisited the design twice in digital color over the intervening years. This is the first version of the design. It’s executed in ink on Bristol Board and it measures about 7 1/2 by 12 inches. 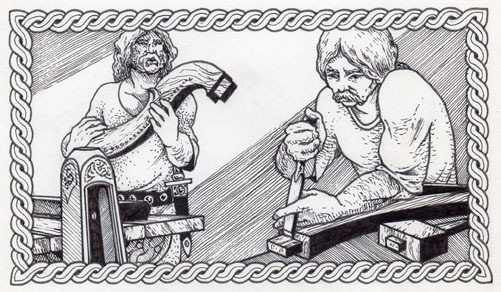 This illustration is from the center spread of Runestaff #28 in September of 1984. 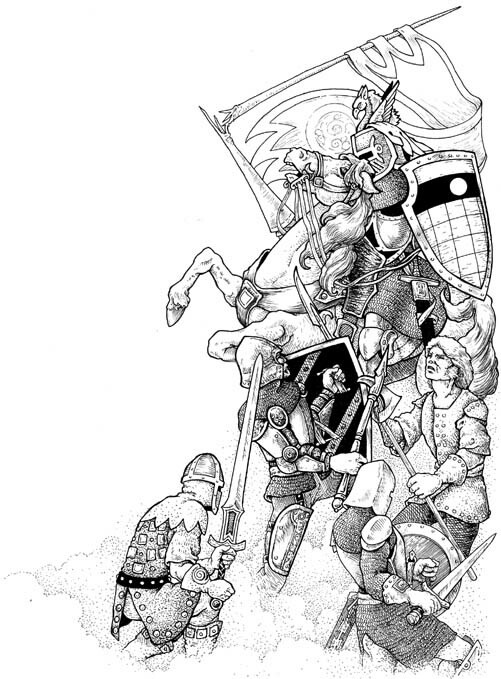 This illustration is from the center spread of Runestaff #30 in February of 1985. 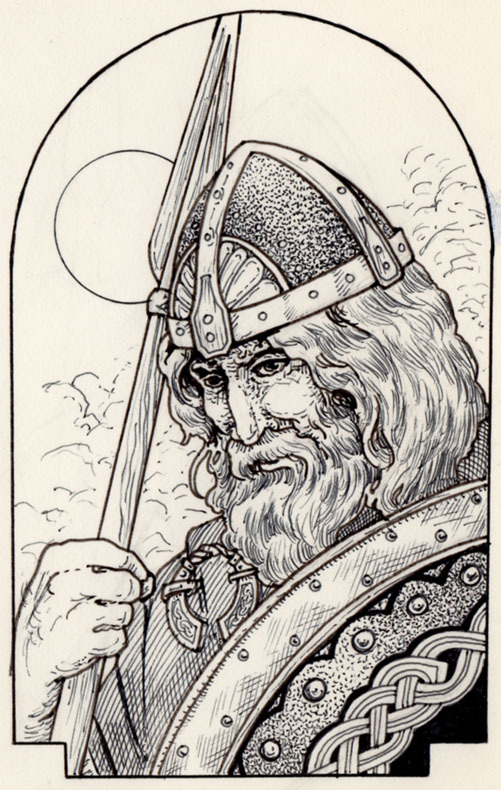 This is the cover drawing for Runestaff #31 in March of 1985. 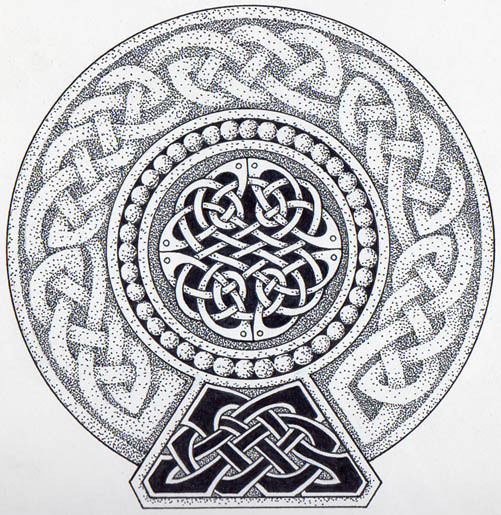 The original drawing measures about three by five inches and is drawn in ink on paper. In almost every case I drew my Runestaff covers actual size and inside this oddly-shaped outline. Then copies were pasted into the decorative border that we used on every cover. These 13″ x 17″ prints, on heavy, glossy paper, were printed for sale at the second conference of the Society of Folk Harpers and Craftsmen. The Society and I shared the revenue. The art first appeared in the December 1985 issue of The Folk Harp Journal, in which I also had an article which, with photographs and diagrams, examined a Scandinavian double-strung harp from the Lachman Collection of Musical Instruments at UCLA. Jay Witcher wrote an accompanying article on reconstructing the instrument. This was pretty cool. I have three of these signed and numbered prints available for sale. They’re numbered 8, 9. and 10. 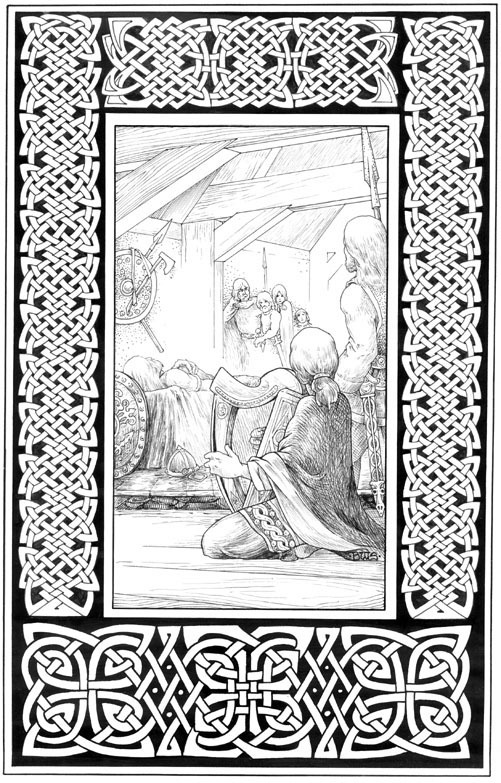 Around 1981 I worked on a retelling of the Arthurian story of Gawain and the Green Knight. I designed a set of six or so borders to repeat throughout the book to frame my hand lettering and the illustrations in a form inspired by William Morris’ Kelmscott Press. Though I remember making several sketches for the illustrations, I think this may have been the only one I finished in ink. The drawing measures about 4 3/4″ by 8 1/4″ on paper. Mystery surrounds this little drawing. Back in the 80’s I often paid my way through sf conventions by drawing and painting nametags for people. I mention that because of the ‘W’. It sounds like it was meant for someone. But it’s the wrong size and shape for a name badge; so that’s probably not it. Though I don’t know why I drew it, I’ve always liked it. The drawing, about 4 1/4″ by 1 3/4″, is on light paper. 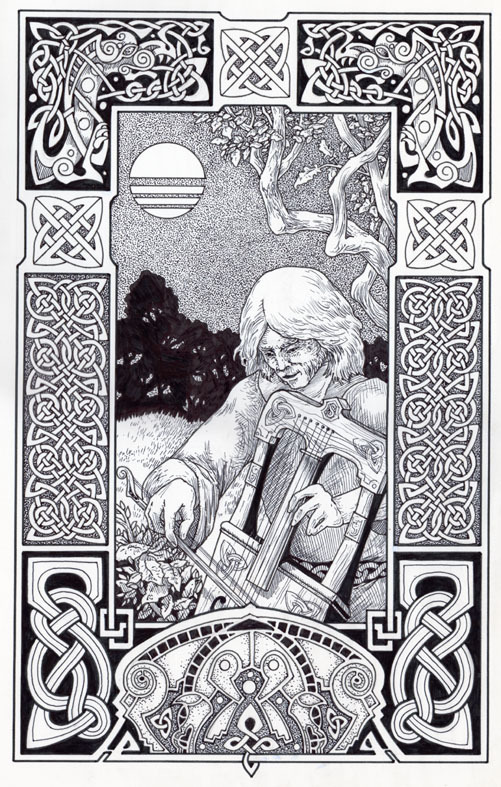 This was the title page illustration for Pat macSwyney’s Celtic Ceilidh for Dulcimer. Since the book was published in January 1986 it’s a safe bet that I drew it late in the previous year. The instrument you see here was based on the one Pat played in those days. It was built by his father at Triskelion Folk Music; the dragon peghead was carved by me. The drawing, about 10 1/4″ by 12 1/4″, is on illustration board. I have no trouble remembering what year this was: my then-wife and I were married then, and this art appeared in our announcements. I used it later on cards, I think. 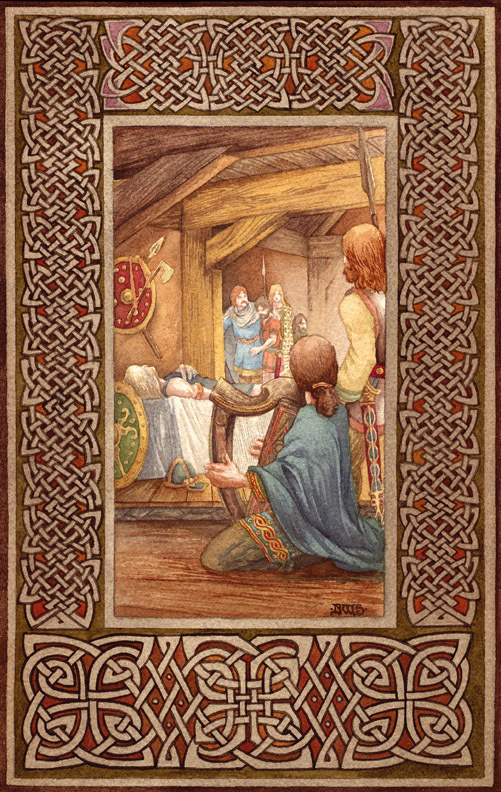 The harp was for me – it looks like one that I owned back then – and the wolf was for her. Because, well, wolves. 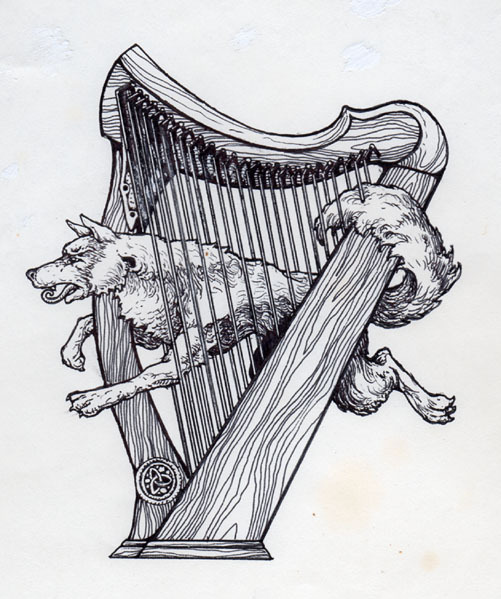 I interlaced the wolf with the harpstrings because, well, symbolism. The drawing’s about 4″ by 4 1/2″ on paper. This ink and wash drawing probably dates from 1981. I recall using the design on a batik shirt back then. But it’s probably one of a series of seahorses I drew and painted just as soon as I realized a woman I’d met would buy damn near anything that had a hippocampus on it. 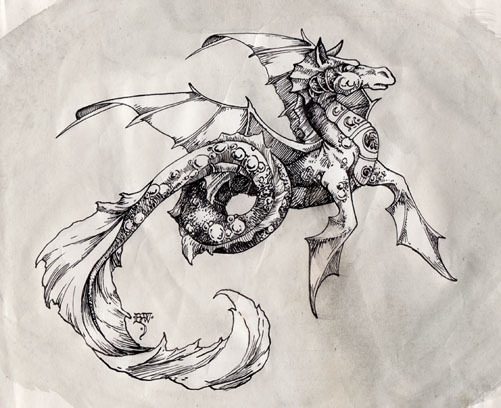 When I was getting pictures ready for an sf convention art show I’d always try to get a hippocampus in there. Because I wasn’t a complete idiot. For one reason or another this one – or this version of it, possibly – never made it into that good woman’s collection. The drawing’s about 6 1/2″ by 6″, on paper. 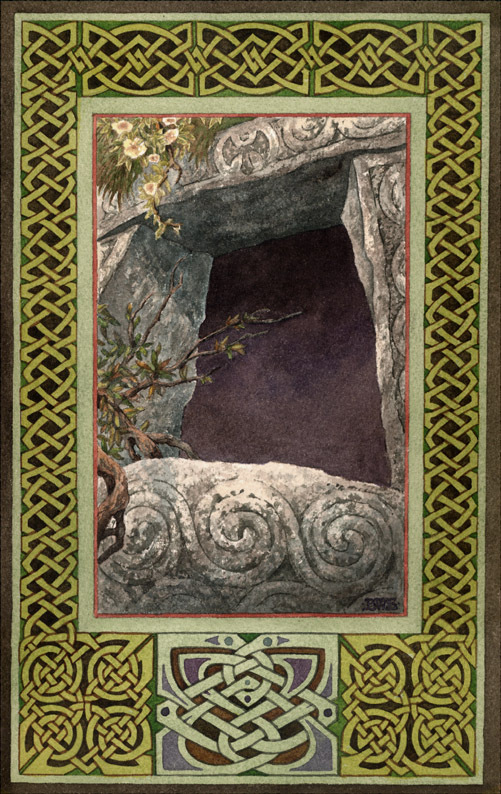 This 1985 watercolor was based on an ink drawing I’d done earlier as an illustration for Runestaff. It is simply matted; the painting measures about eight by twelve inches in a matte of about fourteen by eighteen inches. This is one that I kept for myself and hung for years, though lately it’s been stored.